When Sphero was first introduced last year, Orbotix had some challenges meeting every preorder by December. But those days are long behind the little robotic ball that has sparked some imagination. They are much easier to find and so are the Android and iPhone apps that accompany them. There were only five apps when the Sphero was introduced (nowadays it comes with six out of the box). There are 11 apps out now (but not for every device) and most are free. While some are better than others, it proves Sphero is much more than a one-trick gadget. While easily described as a robotic ball, it's a gaming device with the potential to be as the good as the apps that are paired with it. 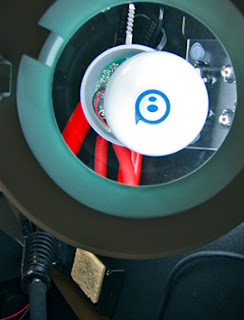 Sphero starts out as a round RC toy. When Sphero was first introduced, the initial interest came from self-described nerds and tech geeks. The majority of the community is clearly guys. The community most intrigued is niche, not mainstream. Mostly, this wasn't because of what Sphero was but how it was introduced. It was, by definition, a robotic ball with about an hour of juice. The iPhone, iPad, iPod Touch, or Android was the controller. The first app for the 3-inch ball is Sphero. Sure, the developers give it more personality with gyros, accelerometers, and LED lighting, but you basically roll the ball around by dragging your fingers across the screen or tilting the smart phone. It doesn't take long to tackle the general idea. The range is reasonable (about 50 feet) and the once it's calibrated via bluetooth, it's suitably responsive indoors or outdoors (sometimes there is a noticeable delay). And many people buy the ball to annoy their pets. I don't get that, but whatever. I imagine results would vary, depending on the pet. So, ultimately, it starts out as an RC toy. In fact, the second app even gives you an old-school remote control interface. And that idea isn't new, even if I wish more RC toy makers would do it. (Not all RC controllers feel as intuitive as a smart phone and many are bigger battery hogs than the toys). But where the Sphero breaks from the RC toy category is that there are other apps. Where Sphero breaks from the roll around concept. The smartest one out of the box is Sphero Golf. With the golf app, your phone becomes a club. Designate the hole (whether a real hole or cup) and you can create a mixed-reality miniature golf game. The manufacturers haven't added the idea yet, but it works even better paired with croquet, with your device being the mallet. Sphero Chromo (iPhone) was the first app to really break away from the idea that the ball is an RC toy only. Depending on how you play, Sphero Chromo can be played like a quick-gesture reaction game or memory game (not unlike the 80s pop culture game Simon). Another credit to Orbotix is that it opened up its apps to third-party developers and there have been several apps developed for it. Most of them are only okay, but it's a step in the right direction. It will be only a matter of time before some people make track ball arcade games (Sphero Exile will be among the first with an Astroid/Galaxia-style play) like Missile Command or Centipede. Or, new multiple player driving and proximity games like Tank (where the ball becomes the tank), pong, laser tag, or other mixed-reality games would knock it up ten notches. It's worth mentioning because while some reviews suggest waiting around for a better price point, the Sphero price is likely to stay put. Instead, there will be more app offerings to make Sphero worth it. Many of them will be free or priced right at under $1 or $2. Sphero By Orbotix Rounds Out At 6.8 On The Liquid Hip Richter Scale. When I first picked up Sphero, I was concerned that the novelty would wear off pretty quick. It almost does — until you think up other uses that those the developers have scripted. And as long as other people are willing to come up with gaming ideas, the ball will eventually pay for itself. You can find Sphero almost anywhere. Sphero Ball (iOS and Android) is available on Amazon or you can find Sphero at ShopTronics. It's priced between $120-$130, but most apps are free. And there is one more thing. You don't have to worry about whether the ball can hold up to wear and tear. While I don't recommend it, it can survive a shotgun blast. Seriously. Rich Becker contributed some ideas to the future app developments for Sphero.